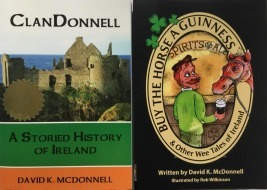 David K. McDonnell is an Irish-American with a passion for both Irish and American history. "If you are an astute reader, you may have gleaned a few things about me already. That's what happens when you write a book in the first person. I am an American and have lived all but a year or so of my life in Michigan. I was born in Detroit in its west side area called Redford. I am married, and my wife and I raised four children in the Detroit area. I moved 'Up North' (which is how folks in Michigan refer to the northern half of the state) when I retired. I now live on Grand Traverse Bay of Lake Michigan. Rarely does an evening goes by without me enjoying the sun setting over Lake Michigan. I attended the University of Michigan in my favorite town, Ann Arbor, as both an undergraduate and law student. I was in school in the turbulent years of the late 1960s and early 1970s. Neither the city nor I settled down much until I was in graduate school in the mid-'70s. I practiced law in Detroit - in the city and suburbs - for over thirty years. In the parlance of the British Isles, I was a barrister for a decade or so. My practice evolved thereafter and I became a solicitor. My job, as I saw it, was problem solving. I helped get clients from where they were to where they wanted to be. Sometimes I helped them see where they ought to be. On a few occasions, I helped clients stay where they were, when the world around them was changing and pushing them to change with it. I represented many, many entrepreneurs. I also represented a number of nonprofit organizations. I helped them define their mission and design operations and implement programs to achieve that mission. I did this sometimes as an attorney and sometimes as a volunteer. I found the practice of law extremely rewarding and, fortunately, financially lucrative. At some point, though, it was time to retire. My passion (next in importance to my family and my law practice) is history. I've always been fascinated by how people used to live, what they used to do, and how that shaped the world that followed." 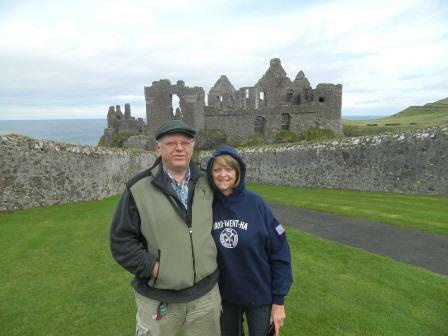 The top photograph is of David and his wife Linda in front of Dunluce Castle in County Antrim, Northern Ireland. The bottom photograph shows David at one of his favorite sites. David is the guy seated at the lower right hand corner, next to his 109,901 closest friends.